Friday September 1st 1899 I took an early start to town to take the butter I brought Mother home with me before noon. I did a little sweeping in the afternoon and sewed some. John Stevens came down to stay all night Saturday September 2d 1899 Mother and I took a ride early this morning up to Charlie Hodges. After we came home did a lot of work before noon. I wrote to Will took the letter to Hill Siding stopped at Callies on the way back. Aunt Lib and [Ossie] were here later in the afternoon. Did evening work. It was a very hot day. Sunday September 3d 1899 Mother and I did up the work and went up home We helped with the dinner. The folks were up from the other house. Jim & Ella Rhodes called in the afternoon. George Bremner was here from Chicago I came home before it was late I stopped for John Stevens. Did evening work and read a little. 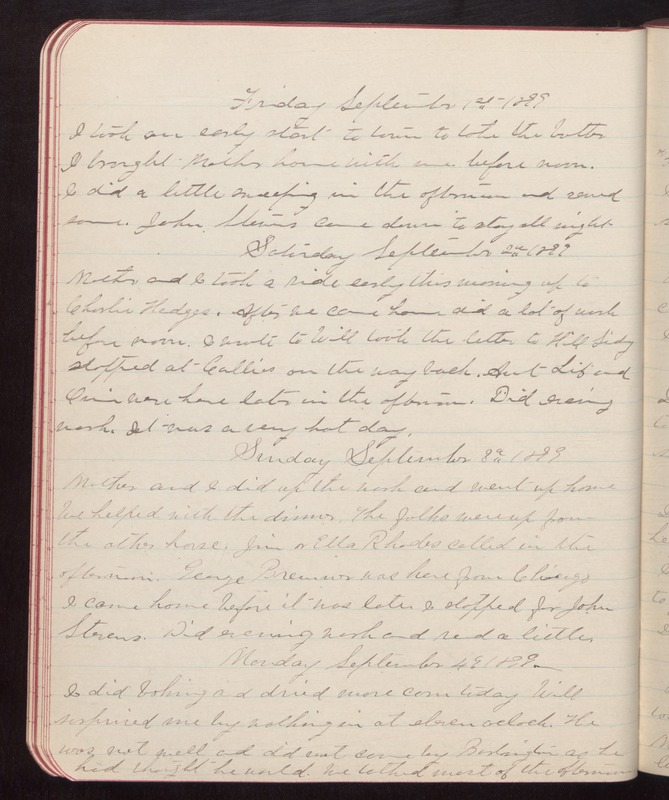 Monday September 4th 1899 I did baking and dried more corn today Will surprised me by walking in at eleven oclock. He was not well and did not come by Burlington as he had thought he would. We talked most of the afternoon.